I have long accepted that I am a bit of a masochist. Looking back over my life, there is a pattern of events and activities where I have paid people to hurt me or to give me the opportunity to hurt myself: competitive gymnastics, body piercings, tattoos, deep tissue massages, paintball, law school, and now running. This Sunday, January 15th, I will be running the P.F. 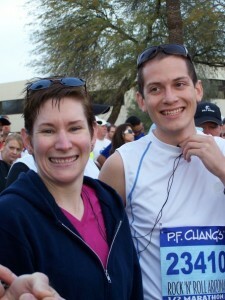 Chang’s Rock ‘n’ Roll Half Marathon for the third year in a row. I have two rules for running the race. My goal this year is to break the 2-hour mark. I finished the race in 2:09 my first year and 2:06 last year. It will be a tall order, but it’s doable. I’ve always appreciated the support of the crowd cheering all of us on. I didn’t understand how beneficial it is to hear people cheering and to see all the signs until I ran the race. It makes a huge difference, especially when you’re tired and your body hurts. If you’re in the Phoenix area Sunday morning, please come out and support the runners. The half marathon route goes through Tempe and Scottsdale. Apparently, I’ll be running right by the fabulous Echo Coffee in Scottsdale. If you’re along my route, please make a sign that makes fun of me, especially the fact that paid money to get up early on a Sunday and run the cold. And in case you were wondering, yes, I’m altering my release and waiver of liability agreement again this year. I will never let the organizers avoid all liability, especially things like gross negligence. If I trip over my own feet, that’s on me; but if I fall because of something they did, I want to have the option to sue them. This year I’m writing in a statement that says the hard copy agreement supersedes any previous agreements, in case I had to electronically agree to the waiver in order to sign up for the race. I’m hoping to have another fun race this year. I’ll let you know how it goes. I’m super excited that two of my cousins are running it with me – their first time doing the race. If you are a lawyer, law student, or friend of the legal community and running the race on Sunday, I created an event for us on Facebook so we can connect and network before the race. I’ll have a sign ready. I’ve been inspired! Not to run with you. Not to support you. But certainly to have a sign ready. Muah ha ha ha haaaa! Yay! I can’t wait to see it! I can’t wait to see my pictures and my video from the finish line.